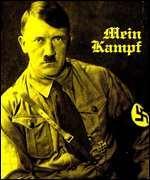 I READ "Hitler's War" and found it fascinating. Thank you for making it available online. I've been reading "Goebbels" with great enjoyment too. Thanks again. They seem to vary somewhat in their translation. In Hitler's War you spoke of the way Hitler always thought, almost to the very end, that Great Britain would make peace with Germany. You also wrote that Hitler believed that Britain was secretly run by Jews. Is it possible that these two beliefs that Hitler maintained kept him from signing any documents that would link him to the liquidation of the Jews? In other words, Hitler didn't want the liquidation of the Jews to be traceable to him if Britain and Germany made peace?